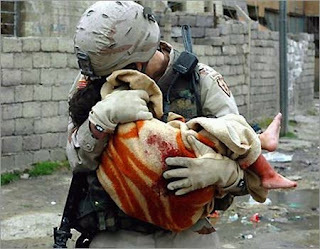 An American soldier carrying a dead body of a 6 month old baby which died during the bombings and when he came across the body of this baby, he took her to his arms and was weeping inconsolably, and he reported to have said that he will not be pardoned by JESUS for committing such crimes on the name of safeguarding the nation. He apparently burried that little girl's body near his camp and just could not go on patrol for the next one week. No matter what you do or try to do, humanity creeps in ... especially if you have a heart.